Waihi Falls, 14kms off the Weber Rd between Dannevirke and Weber on the Waihi Stream. Between heavy rain showers the dusk produced a beautiful light and while the sunset was to the left of centre of the image direction, the low clouds above reflected this awesome light down over the wet rocks of the waterfall and onto the water. I tried a neutral density grad filter to grab the sky but was not happy with the results so I took a second exposure for the sky detail. Raw conversion and all image adjustments in Capture One Pro 7 using layers for selective adjustments. 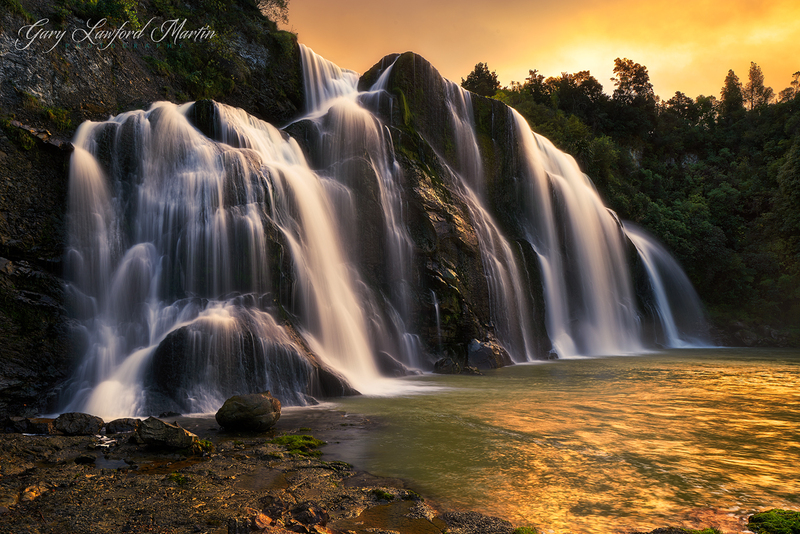 Both images exported to Photoshop CS5 for blending the waterfall image with the sky.